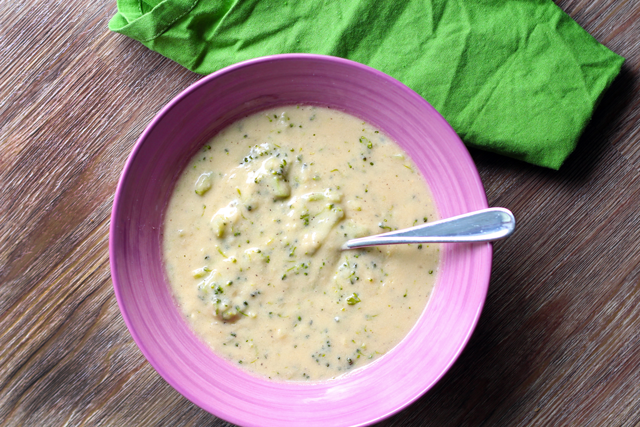 My dairy-free broccoli cheddar soup is sweet, rich, and creamy, just like the dairy version. I’ve been craving this soup since one of my friends ordered a big bowl of it at Panera! Isn’t it so disappointing to see a yummy soup on a restaurant menu, only to find out it has dairy in it? Please tell me I’m not the only one who goes through this. I don’t know how many times I’ve asked about a seemingly harmless tomato or butternut squash soup, only to find out it’s made with cream. It’s a total downer. Oh, and you have to be specific and ask if there’s any dairy in it, because many times I’ve asked if the soup is vegan, to which the cashier behind the counter confidently responds “yes, this is a vegan soup.” Turns out some people do not know the difference between vegan and vegetarian. So now I make sure I say, specifically, I am lactose intolerant, and I can’t have any milk or dairy. I feel like a total alien when I do this. People always look at me like I’m crazy. That being said, perhaps I was crazy to re-create a soup thats key ingredients are milk and cheese, but the result was better than I could have expected! 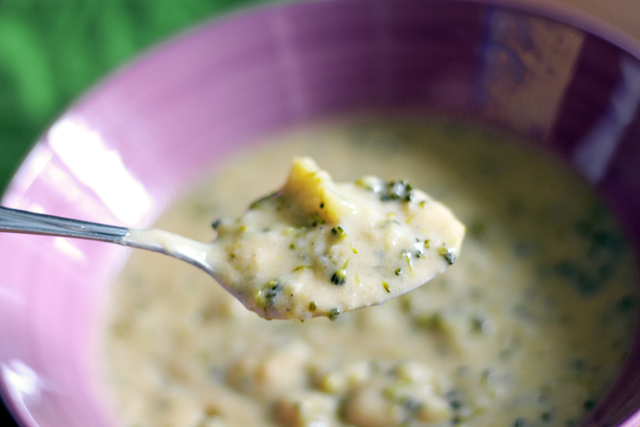 I am always impressed with this soup every time I make it, and so are my dairy-loving friends. 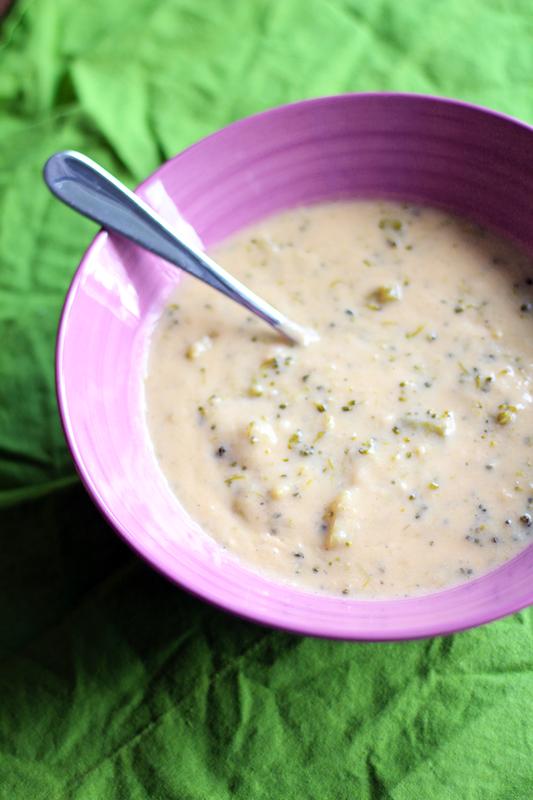 The combination of sweet onion and sweetened almond milk in this recipe makes a perfect dairy-free soup base. Sweetened almond milk is ideal for savory recipes because its flavor is closer to cow’s milk. I recommend following the first few steps of this recipe to make any dish that calls for a cream-based canned soup, such as chicken and rice casserole. It can always be pureed in a food processor for a smoother texture. A dairy-free cheese I recommend using is Trader Joe’s Shredded Soy Cheese Blend, but it’s not completely vegan. For vegan soup I recommend using Daiya Cheddar Style Shreds. I’ve also used rice cheese in this recipe with great results. Sometimes I like to use what I call a fake cheese cocktail: a mixture of different soy or veggie based cheeses to achieve a more natural flavor. The cheddar-style flavors can be very strong, and they taste more realistic if toned down with parmesan flavor or mozzarella. Experiment with different brands, but I usually agree that less is more when it comes to adding fake cheese. Try half a cup and judge the flavor, and then add more if you like it. In a large saucepan, melt vegan butter over medium low heat. Add onions, salt, and pepper and cook for 5 minutes or until onions are tender. Add flour and cook for 1-2 minutes, careful not to burn the flour. Slowly whisk in chicken broth until well combined and bring to a simmer. 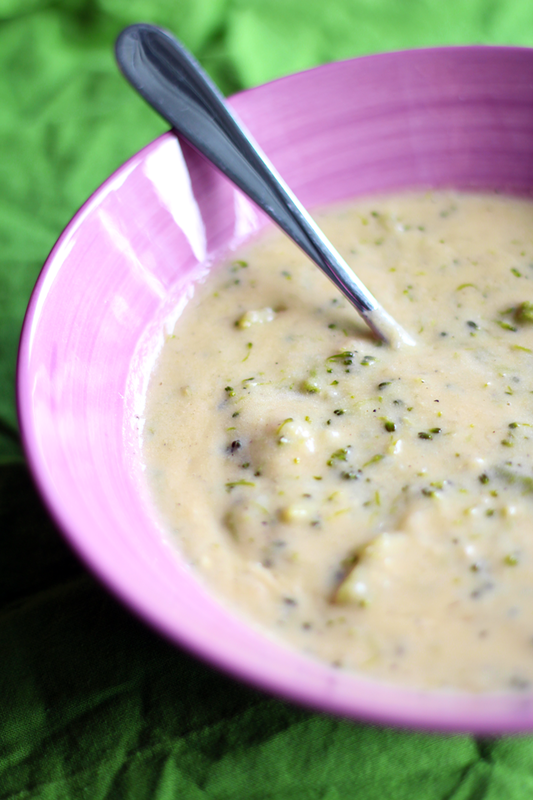 Whisk in almond milk until blended, and then stir in broccoli. Cook uncovered at a simmer over low heat for 15-20 minutes, until broccoli is tender, stirring occasionally. Do not bring to a boil. Finally, whisk in the vegan cheddar cheese until melted. * Salt and pepper to taste. ** Remove saucepan from heat and serve. *Depending on the brand used it can be tricky to melt completely, so I say whisk it. Whisking will also break down some of the larger broccoli pieces, creating a smoother soup. Different vegan cheeses vary in taste. You may find that your soup tastes better with more cheese added. **Depending on the type of vegan cheese and broth used, the salt content will vary. Taste the soup when it's done before adding any extra salt. I made this particular grilled cheese using Trader Joe’s Soy Blend of Mozzarella, Jack, and Cheddar Flavors. Grilled cheese is one of those comfort foods you don’t have to lose with lactose intolerance. Fake cheese works surprisingly well as a substitute. The trick is to blend it with other flavors. Some fake cheese options are better than others. I’ve tried many different kinds of soy cheese or vegan/dairy free cheese alternatives. One version of sliced cheese singles I can recommend are Veggie Slices. These are soy based, but they do contain milk protein so watch out if you are allergic. They taste terrible on their own but make a great grilled cheese sandwich. I’ve used them for cold sandwiches but I’d honestly rather do without the fake cheese. This stuff tastes best cooked in something or melted. If you are looking for vegan and completely dairy free, I always recommend Daiya Shreds. Although for taste, I prefer soy blend cheeses. Two other types I like are Trader Joe’s soy mozzarella and shredded soy blend. These are sometimes hard to find in the cheese aisles so look thoroughly. I always find Daiya Shreds and Veggie Slices at Whole Foods. Other pluses to lactose free cheeses: no cholesterol, less saturated fat, less sodium, and easy to digest. Adding another filler in your sandwich blends with the fake cheese, making it taste more authentic. I like to add pickles, tomatoes, bacon, or all three to perfectly replicate a dairy grilled cheese sandwich. Get a nice, thick bread, like sourdough, spread on the SmartBalance Light, and honestly, it’s hard to tell the difference.